JOUEF HO SCALE 8845. CFL ELECTRIC ENGINE. And this is a very reasonable fee to ensure your item arrives safe and sound and intact! ENGINE TESTED, RUN BOTH DIRECTIONS WITH WORKING DIRECTIONAL LIGHT. EXCELLENT CONDITION. JOUEF 836200 SNCF CLASS BB 25531 E-LOK LOCOMOTIVE MINT BOXED. Condition is New. Shipped with USPS Priority Mail. 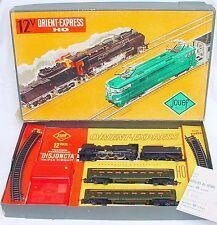 2x Original Jouef 1:87 Green Standard Passenger Coaches. (Original set as it was sold in the `60ties!). The set was made in oen small run only, back on the `60ties. The box is the most important item from this set. Jouef HO SNCF French BB 67407 + CC 70002 DIESEL LOCOMOTIVE 8539 8561 Set MIB`76! Original Box! -Condition: 1x 100% Top Mint Condition! 1x Good Condition. A Fantastic and Less seen model set of two famous French Diesels. These models belong to the most famous diesel models used in the `60ties and `70ties. Item:Diesel Locomotive REF of the SNCF. Special Features:The Testrun went well in both directions. The box shows minor age wear. System: DC digital with sound. Period: III. Flywheel(s). Sprung buffers. Functional pantograph(s). 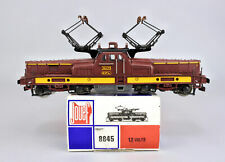 JOUEF HO SCALE REF 8592. ELECTRIC ENGINE. And this is a very reasonable fee to ensure your item arrives safe and sound and intact! ENGINE TESTED, RUN BOTH DIRECTIONS WITH WORKING DIRECTIONAL LIGHT. System: DC digital with sound. Front/rear lights: white and red, directional. Flywheel(s). Sprung buffers. Functional pantograph(s). VERY RARE! -Condition:100% Top Mint Loco! Harldy used if ever! No breaks or missing parts! A super addition to your collection! Wonderful and Rare Heavy Steam Loco! Its the Brown "Du Nord" version of the famous French 231 Pacific Series! Jouef HO 1:87 SNCF French 150x29 "AUDUN" 2-10 Big STEAM LOCOMOTIVE MIB`80 RARE! (French State Railways). -Scale:1:87 HO. Enjoy them! Enjoy the benefits of DIVANDO! It`s safe, fast, easy and cheap! Enjoy this great service! Join the team! TOP RARE VERSION! Jouef #8865. DB 562 - 3. Electric 139. CIWL BAGGAGE CAR. JOUEF HO SCALE. WITH WORKING TAIL LIGHT. And this is a very reasonable fee to ensure your item arrives safe and sound and intact! EXCELLENT CONDITION,WITH ORIGINAL BOX. Zamac chassis enclosing the engine. detail parts (bogies). fixed buffers. 2 motor bogies. gear transmission and worm gear. Here I have for sale one Jouef military wagon, scale HO. The wagon is painted like military camo colors of WWII. Jouef HO 1:87 French SNCF HIGH SPEED TGV ATLANTIQUE 4-Piece MULTIPLE UNIT NM`85! Scale:1:87 (HO Model train Lay-Out scale.). -Condition:Near to Top Mint! The set was used, but handled with great care. Very slight playwear/side rubbing spots. It's the first version with Large Logo! JOUEF HO SCALE 6511. And this is a very reasonable fee to ensure your item arrives safe and sound and intact! LIKE NEW CONDITION WITH ORIGINAL BOX. BOX SHOWN MINOR SHELF WEAR. Jouef HO SNCF French 67001 DIESEL LOCOMOTIVE & CIWL ALPENROSE WAGON Set`76 RARE! It was previously used, but very well taken care of! Very clean. The Original International CIWL ALPENROSE Colors as used in France! A fantastic mid `70ties Jouef Trainset, fully complete! The passenger wagons look like new! They where previously used, but very well taken care of! Very clean. The Original International TEE Colors as used in France! A fantastic mid `70ties Jouef Trainset, fully complete! The passenger wagons look like new! Jouef HO 1:87 French SNCF HIGH SPEED TGV ATLANTIQUE 93695 UNIT NM`85! Jouef HO 1:87 French SNCF HIGH SPEED TGV ATLANTIQUE 4-Piece MULTIPLE UNIT NM`85!. Condition is New. Shipped with FedEx Ground or FedEx Home Delivery. em Jouef Gran Confort Passenger Car 1:87 HO Trans Europ Exp Int Light . Condition is New. Just took out of box for pics. Please check out the pics for contents and condition. Jouef HO 1:87 SNCF BB-66150 DIESEL LOCOMOTIVE + BUTAGAZ TANK WAGON Set NMIB`78! (5 Pieces!). -Condition:A Wonderful Combined lot, including the famous French SNCF BB-66150 Diesel Locomotive used for heavy goods trains! The loco looks fair to good! All works fine. You will love it. (Special Series Produced after the take-over of Eggerbahn, Germany.). Many rare models will be listed! Both boxed and loose. Check them all! Coach is HO Narrow Gauge! Enjoy them! A Fantastic Treasure! Jouef HO 1:87 SNCF French BB 25531 "VERT" ELECTRIC LOCOMOTIVE 8362 MIB`76 RARE! Condition: Near Mint Condition! Hardly used. Minor signs of use. If even visible! Very well taken care of! Very clean. Dark Green. A fantastic early Jouef model with wonderful detailing! Vends Ce 66453 de chez Jouef HJ. Modele analogique. echelle HO. Marquages SNCF. échelle HO. n° immatriculation loco 141 P 184. époque III. Vous voulez en savoir plus ?. les photos sont contractuelles. compatible avec Roco, Lima, Trix, Electrotren, Liliput, Fleischmann, Piko, Peco, Ls Models. Jouef HJ2352 Vapeur 141R tender fioul 9,5 m3. Version analogique. Version - Analogique. Echelle - HO. Epoque - III. Version analogique. Version - Analogique. Echelle - HO. Epoque - III. Eclairage - Oui, AV/AR inversés. NEUF -Jouef HJ 2146 Vapeur 150 C 822 SNCF époque III Analogique, dépot de Longwy. Se hablo Español. English spoken. Locomotive diesel BB 67530. Livrée bleue à plaques, sans jupes avec blason Romilly du dépôt de Strasbourg. Dépôt de Strasbourg. Version DC analogique. Version - Analogique. Echelle - HO. Epoque - IV. Sachet de détaillage inclus. Locomotive Diesel BB 67557 Bleue SNCF Analogique. JOUEF - HJ 2340 - Echelle 1/87. Epoque IV de la SNCF. Analogique - Prise décodeur 21 broches. Le modèle analogique n'a pas de connecteur numérique. Locomotive 2-3-1 K HO JOUEF 8255 / PACIFIC, très bon état, analogique. Modèle analogique Il n'a pas de connecteur numérique. JOUEF HJ2221 - Locomotive diésel BB 67229 ép IV/V SNCF HO analogique, avec notice et accessoires à monter, état neuf. JOUEF 5630 - Fourgon à bagages C.I.W.L avec feux rouges éclairés HO, état neuf.